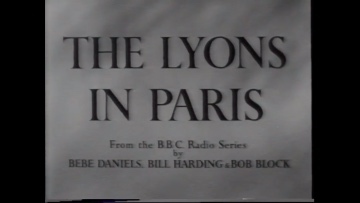 As a wedding anniversary surprise for Bebe, Ben takes the family on a trip to Paris. Once there, the atmosphere of the romantic capital of the world weaves its own special magic which, this being the Lyons family, only results in one disaster after another and a series of misunderstandings leading to Ben having to take part in a duel over another woman! Philip Martell gets his first credit for Hammer with this film. Later on, he succeeded John Hollingsworth and became the Company’s chief Musical Director, a position he then held right through to Hammer’s last cinema film, “The Lady Vanishes” (1979).